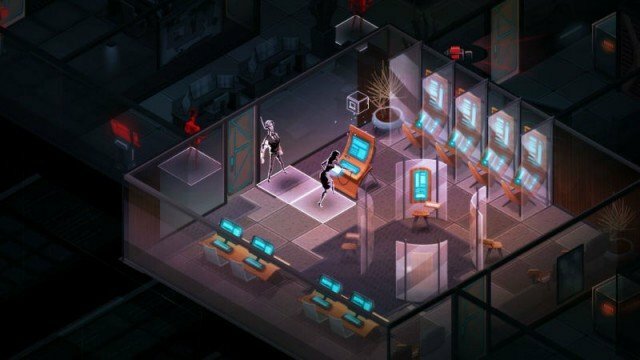 The steep challenge of Invisible, Inc. Console Edition is certainly not for everyone. However, for those up for it, Klei Entertainment's latest effort is a thrilling and excellently crafted adventure set in the world of futuristic espionage. When I first heard the news that there were no plans to bring XCOM 2 to consoles anytime soon, I was crushed. As a huge fan of Enemy Unknown, it was disappointing to hear that I wouldn’t get the chance to play the sequel until I had a computer capable of running it. Lord knows that isn’t happening anytime soon. So luckily, while one developer moves to the PC, another – in this case Klei Entertainment – has chosen to enter the world of home consoles. Originally debuting on the PC a little over a year ago, the futuristic Invisible, Inc. has now made the jump to the PlayStation 4. If you couldn’t tell from the what I said above, much like XCOM, Invisible, Inc. is a turn-based strategy game. Unlike Firaxis’ popular franchise, though, the protagonists here don’t have the weapons to combat their enemies. As the name would imply, this title is all about keeping to the shadows and becoming invisible, so to speak. Each operative in your party has a limited number of actions they can complete per turn, and considering every step you take uses up an action, you’ll need to really plan out how you want each turn to go. The agents can also collect power by either hacking certain devices or through augmentations. These bits of power are then used to activate Incognita, a powerful hacking program that can open up loot-filled vaults or disable security cameras, and is basically necessary in order to complete any mission you choose to accept. Once the first tutorial mission is out of the way, players are given a 72 hour window to get prepared for a final conflict with the corporations after the agency. During this window, you’ll have free reign to pick which missions you want to undertake from a world map. Figuring out which mission to pick is important, though, as factors such as how much time each one takes and what the goal is could make or break your campaign. Different types of missions include breaking into detention centers that hold captive agents, raiding corporate vaults that will bolster your bank account, and utilizing enemy labs in order to further augment your agents. If this sound stress-inducing, believe me, it certainly is. 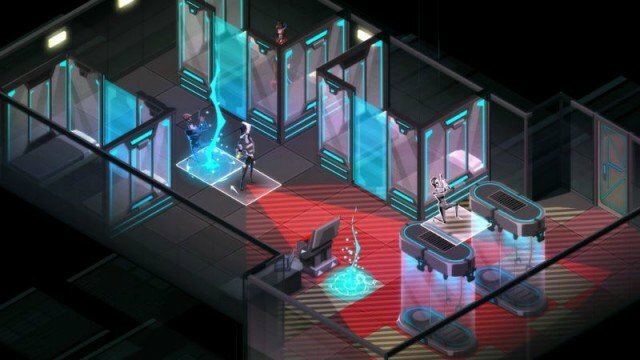 Even on the easiest difficulty setting, you will most likely repeatedly fail to complete the Invisible, Inc. campaign. There are simply too many things to take into account on your first go-around. Thankfully, Klei Entertainment realizes this, which is why the loose rogue-like elements of the game are so helpful. Even if you botch a mission and lose your agents, you’ll still unlock new agents or tactics that can be used for the next campaign. And considering every level is randomly generated, the additional gear is pretty much the only help you’ll have for another shot at victory. Looking online, it’s not hard to see how some gamers may be frustrated with Invisible, Inc. due to its harsh difficulty. Sometimes it does seem like the developer is purposely withholding information in order to ramp up the challenge of the game. The absence of a proper map, specifically one that showed where I had to go, was also pain to deal with. This, combined with both the sprawling maps and constantly rising alarm, could also lead to some becoming disillusioned with the title. It could just be me, but during my time with the game I found it surprisingly easy to get lost during a mission. With that said, Invisible, Inc. does play by the rules for the most part. 99% of the time I failed a level, it was because I was either sloppy with my sneaking, or took too long trying to get everything. Most of the missions in the campaign have a high risk/high reward factor, and making the tough call on whether to go for that last safe or finish the mission could be the difference between life and death. To me, that’s exhilarating, and the freedom given to players in this regard is one of the reasons why the title stands out as much as it does. There’s also something to be said for the immense feeling of satisfaction that comes from when you do eventually make it through a tough mission in one piece. Successfully rescuing a fellow agent, as well as looting several safes, provides the rare feeling of accomplishment that few games have managed to replicate. This is one of those releases that makes you want to learn how to become better at it. The more time you spend honing your skills, the better you’ll be at making it out of the 72 hour window alive. There is an overarching story to Invisible, Inc., although it doesn’t play as large of a role in the game as you think it would. At the start, the titular compound is raided by enemy soldiers, with the only escapees being you, the Chief, two agents (in my case, Decker and Internationale) and the Incognita program. Over the next 72 hours, the remnants of the team, as well as augment dealer named Monst3r, will work together to launch one final assault on corporation headquarters. Really, the loose storyline is only used to get the player into action as soon as possible. It only gets brought up to remind you that you have a limited amount of time before the end of the game. It’s strange that it’s thrown on the back burner, though, as the agent profiles are pretty interesting. 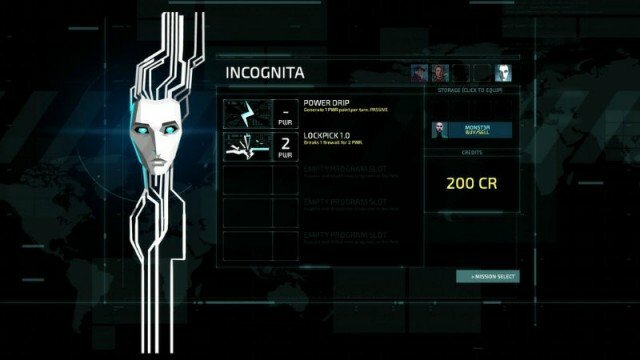 Learning about the different operatives working for Invisible, Inc., including the likes of Draco and Rush, who come with the included Contingency Plan DLC, made me care about them more in-game. Visually, the cel-shaded look of Invisible, Inc. feels like a natural fit for the title. The sleek and colorful visuals do an effective job of depicting the futuristic world found in the game. The character models are fantastic too, as even basic designs such as the Chief and Decker stand out on screen. The visual splendor may have come at a price, though, as I did encounter some slight performance issues. During several of the later missions, there were some heavy bouts of lag that didn’t allow me to select actions immediately. Brutally tough, but absolutely fair, Invisible, Inc. Console Edition won’t appeal to everyone. The unforgiving challenge of the game will almost certainly be a wall too high for some. However, if you’re willing to put the time in, Klei Entertainment’s turn-based strategy title is worth taking the plunge on. The intense stealth-based gameplay and sleek look make for an enticing combination that rewards those that are looking for a challenge. If you’re willing to step up, The Chief will take all the help she can get. This review was based on the PlayStation 4 version of the title, which we were provided with.